IBASSIN: 2017 Costa FLW Series Championship on Kentucky Lake Day 1: Bryan Thrift Takes Massive Lead! 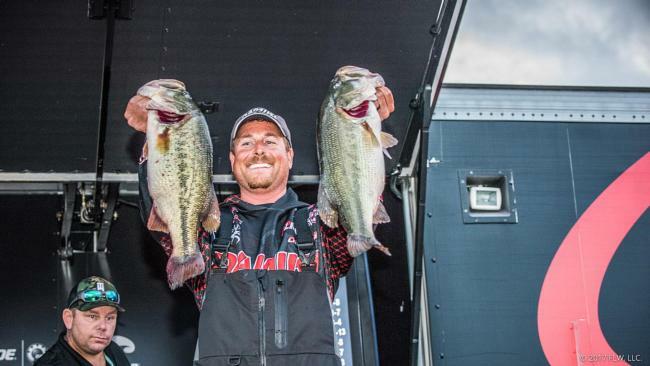 2017 Costa FLW Series Championship on Kentucky Lake Day 1: Bryan Thrift Takes Massive Lead! Thrift proves why he is a winner! Day one of the Costa FLW Series Championship on Kentucky Lake started slow for bass-fishing superstar Bryan Thrift, but it quickly turned into another epic outing for the 2017 FLW Tour Angler of the Year when he piled about 25 pounds in his livewell on one spot this afternoon to top off a 27-pound, 8-ounce limit. The performance has him in first place by a margin of 7-1 over Alabama pro Cameron Gautney. Justin Hicks of Roanoke, Va., leads all co-anglers with 16-13.